Our Permanent Marker Bullet Tip Pens offer long lasting and reliable function in any scenario, from hosting that important cross-business meeting through to brainstorming with your team. Suitable for use on virtually any surface, their non-toxic and low odour ink formula is distributed through a pointed bullet tip which allows you to adjust the weight of each stroke. A great resource in all manner of work environments, this handy pack of 10 pens feature push down lids that eliminate the risk of ink drying and preserve the longevity of each writing tool. 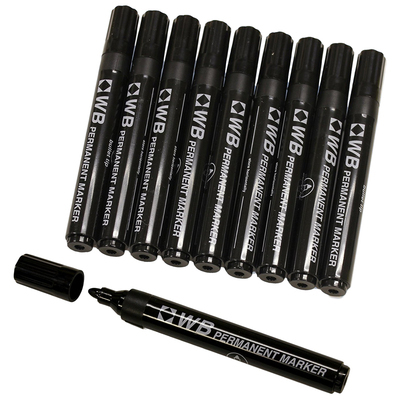 Each permanent marker can be easily distributed throughout your group or stored away until required with the rest of your stationery items. Depending on your specific requirements, we have a wide range of stationery items available for exceptional wholesale prices right here. Everything from our Drywipe Markers in assorted colours through to our Laundry Markers in Black, take a scroll through our offering to find the perfect product for your needs - and at exceptional wholesale prices.